Pendulum, 12-faceted Clear Quartz w/ Amethyst12-Faceted Optically Clear Quartz with delicate interior feathers mounted on Sterling Silver Chain with Sterling Heart Charm, Clear Holding bead and genuine Amethyst bead . 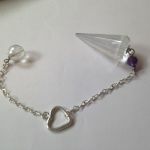 Description: 12-Faceted Optically Clear Quartz with delicate interior feathers mounted on Sterling Silver Chain with Sterling Heart Charm, Clear Holding bead and genuine Amethyst bead . All Wisdom Light Pendulums are handcrafted in the USA and support women-owned businesses. 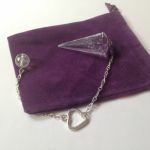 All Wisdom Light Pendulums included a free Violet drawstring pouch. Every pendulum is shipped Priority Mail 2-3 day service in the 48 contiguous US states; overseas shipments will be quoted separately upon order receipt and destination details.